The graduate school provides a platform for graduate students to move into careers in a number of different capacities: 1) Highly specialized experts who can demonstrate a broad understanding of technologies and contribute to local community development; 2) Highly skilled engineers with an international perspective; 3) Researchers who can challenge the frontiers of research and stay ahead of the needs of the times. 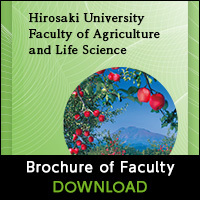 Fundamental academic background in the agricultural, biological, and environmental sciences. Students are selected based on the cumulative results of submitted applications, written examinations, and oral examinations, all of which assess fundamental academic skills in the agricultural, biological, and environmental sciences, as well as the candidate’s intellectual curiosity and drive to do research. The universality observed in the basic life activities of all organisms and the biodiversity that is observed in the morphology and behaviors of individuals are formed by the interaction between the genetic information coded in DNA and the surrounding environment. 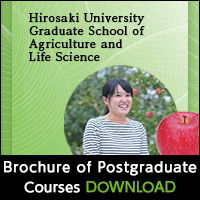 This graduate program focuses on research related to understanding the factors supporting basic life activity processes and their mechanisms, including development, energy metabolism, adaptation and evolution, as well as research on dynamic and composite biological and ecological systems formed through the interaction of individuals, the environment, and biodiversity. Graduates of this program will move on to careers as researchers in biological fields, biotechnology experts knowledgeable in agriculture and food products, and specialists who can work towards the conservation of ecosystems. Life is constantly sustained by the many chemical reactions of biological molecules (enzyme reaction system). Technologies that utilize such systems are expected to play an important and multifaceted role in the near future. This graduate program is designed to turn out researchers, highly-specialized experts, and Ph.D. candidates with an international perspective who can succeed in and contribute to society by applying their specialized research knowledge and technical skills related to biological functions and reaction mechanisms, as well as the production and control of matter by organisms. This graduate program is designed help graduate students become skilled specialists in the research and development of breeding technologies for new food plant varieties, soil and pest management in food plant production, and food product function and safety that ensure a sufficient, environment-friendly, and sustainable food supply. The program focuses on research that leads to the revitalization of agriculture, the development of better agricultural production techniques, and the improvement of food production systems and the environment, with the ultimate goal of establishing sustainable and multi-functional agriculture and human livelihoods. Graduate students will acquire specialized expertise and knowledge in agricultural production and agricultural management, economics and distribution, and develop the ability to independently identify and solve problems in several areas of expertise. Challenges that will arise in the 21st century include the need for sustainable agricultural practices that are appropriate for the natural environment and climate of northern Tohoku, the development of the region as a food base and the promotion of suitable conditions for rural communities. The consideration of “soft” issues such as business planning and the selection of agents for these programs will also be necessary. This graduate program therefore addresses topics such as the management and development of production infrastructure, the maintenance of suitable living environments for local residents, and the development of planning methods. This program will strive to turn out graduates with highly specialized expertise, advanced technical skills, and proactive problem-solving skills who are able to work towards the protection and conservation of the natural environment.